Heh. Well, unless you’re of a certain age, you probably don’t. Created back in 1975, mood rings were these quirky, goofy rings with a fabricated stone that responded to–the makers claimed–your mood. If you were happy, the stone was a lovely aquamarine blue. If you were depressed, it was gray. Angry? Red. And etc. They were all the rage for a couple of years, and then, like most gimmicks (think Pet Rock), they faded mostly off the market. *Note: A quick googling tells me that mood rings are still out there, now in a huge variety of shapes and settings. Who knew? Anyway. Back in August of last year, when I was in the middle of packing up and moving Mom and myself to our new apartment, I bought not a mood ring, but one of those little solar-powered toys for a couple of dollars to cheer myself up. It was a rough time for both of us: physically and emotionally exhausting at once. My toy is a daisy that nods its flower head from side to side, and sorta flaps its little leaves up and down when the sun hits the sensor. I used a black Sharpy to draw a little smiley face on the yellow middle of the daisy, too. It just tickled me. Since then, I’ve gotten into the habit of setting it in my window when I get up in the morning so it nods happily nearby as I work. No matter how much pain I’m in or how blue I might feel, it makes me smile whenever I look at it. Oh, woe! 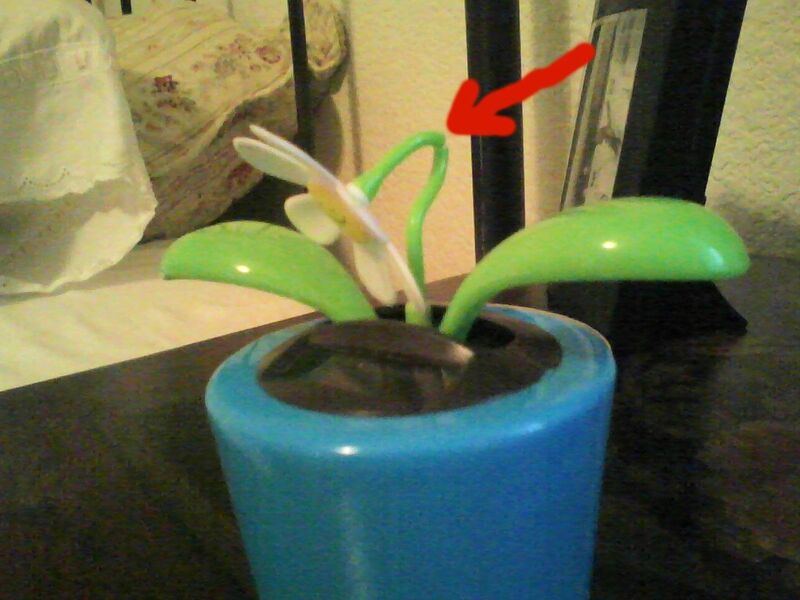 Somehow my toy daisy’s stem got broken at the curve. It’s little head was drooping sadly. Now, here’s the thing. When I saw it, my mood just flopped to my slippers. It’s silly, I know. I can replace that toy without much effort or cost. But it was special because of when and why I bought it, and that time is past, gone, and can’t be reproduced. And that’s what made me think of those goofy mood rings. If I had one now, I wonder what color it would be. Black? Olive green? Brown? I’m going to try a drop of epoxy or tape or something to fix my Happiness Daisy. In the meantime, I’ll just have to remind myself that life does go on, and in spite of the highs and lows, it’s usually pretty darned good–today included. Here’s hoping that your Happiness Daisy, whatever it is, is smiling for you today. Aaaaw, I hope you can fix it! Completely understand about the sentimental value! Another one just wouldn’t be the same! Poor daisy! And you! Hope you can fix it. Remember, though, that the daisy is still there. It just has a kink (RA?) in its stem. My daisy is called Lucy. She makes me smile even when she barfs in my shoes. What’s the status? Were you able to fix it? And no, it’s not silly to feel sad over a broken flower. I think we all have our little things that help brighten our mood and holds sentimental value. I actually own a mood ring. My granddaughter likes wearing it. I don’t even know where or when I got it, but it’s a conversation piece. I hope your little flower can get fixed. It does look awfully cheery, though a little droopy at present. Anything to give your spirits a lift, especially on those mornings when you feel like the tin man, or rather, tin woman.